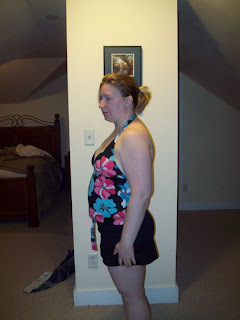 This is what I looked like after cycle 3 ended 17 days ago on 2/21/11 with a weight of 165.6. 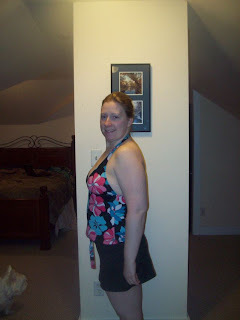 And this is what I look like today 3/10/11 at the end of my 4th 17 day cycle with a weight of 161.5 (BMI=28.63) for a loss of 4.1 lbs and a total loss of 21.5 lbs so far. That's what 20 extra lbs looks like. I am finally feeling a real difference in my body, and seeing a big difference in the way clothes fit. I went shopping (by myself! whoohoo!) last weekend and actually had a lot of fun trying clothes on. The sizes are smaller, for starters. And now it's not about finding clothes that disguise my body as much as possible, but finding those clothes that look great on me. Hello skinny jeans! And while I wouldn't recommend having the stomach flu as a weight loss strategy, I was quite sick last Friday and lost two lbs, which I was able to keep off. It was nice to have some momentum again, since my weight loss stalled for a couple of weeks. Since then, I've been losing pretty steadily again. I will admit to my fair share of emotional eating though and know I should stop having handfuls of m&ms every time I go in the kitchen. Things are just a little nervewracking for me right now. First my two year old had to go to the cardiologist for testing (he's fine) and then we came to the incredibly painful decision to put our dog to sleep tomorrow. I'm really, really sad about the whole situation--but we've been dealing with his aggression for more than 18 months already--consulted experts in Westie behavior, tried behavior modifcation, tried medicating him for pain, and he's still unpredictable and volatile. I love him with every fiber of my being, but he's clearly not in his right mind anymore. In a wierd way, all this working out I've been doing has made me strong enough to face this inevitable outcome. I've been working through physical pain for a couple of months now, and I've learned how to shut my mind to the pain (physical and emotional) and just do what needs to be done. Yesterday, after I called the vet, I went to the gym and did a really strenuous body sculpting class. At times it was so hard I thought I would pass out, but I did it anyway. The old me would have stayed at home, crying, and drowing my sorrows in food, but I realize now that that's totally counterproductive. If I'm going to be in pain anyway, I might as well be in it at the gym. Tonight I'll do a spinning class. My gym schedule is not as aggressive as I would like it to be. But I have found a good momentum, and get to the gym as often as I can sanely do so. Mondays and Wednesdays I body sculpt. Saturdays (or Thursday nights) I spin. Most other days I try to do a 30 minute wii run. I probably work out consistently 5 days a week now. I'm looking forward to the end of the snow so I can bring my workouts outdoors. Way to go on the progress. I had gotten to day 10 and blew it. You look fantastic - it's funny, its the clothes that fit better than hte scales that make the difference. You look fantastic, and your blog postings have been very motivating and insightful into the fact that the 17DD can really work! Great job! !